Xpy Burner, is a rogue anti-spyware program. Xpy Burner infects computers through Trojan Zlob, popularly used by Trojan makers who add it to fake video codecs so it can later display fake warning messages that drive you to purchase rogue software. Once Xpy Burner infiltrates your system, it may start to annoy you repeatedly with pop-ups or system alert messages used as scare tactics. It scares you into purchasing a full version of the Xpy Burner program. Xpy Burner is also a clone of Hdrivesweeper, System Security. Xpy Burner does not live up to its expectations as it is not really capable of removing parasites or viruses. Xpy Burner will also install a Trojan as a Browser Helper Object in your IE to display pop-up ads from mxlivemedia.com whenever you surf the Web. Xpy Burner should not be purchased under any circumstances. 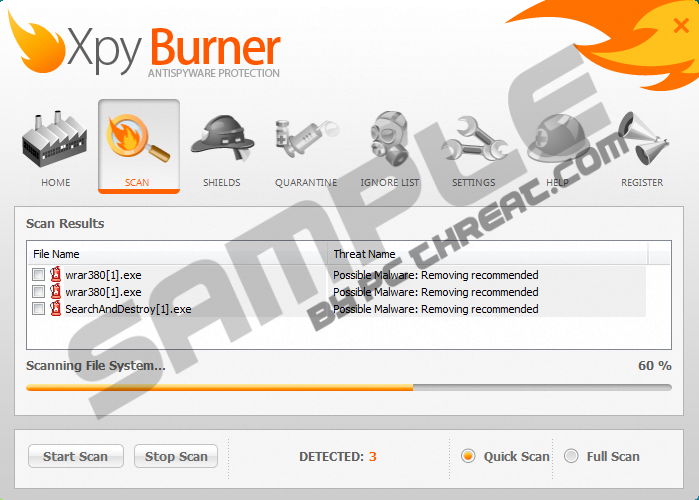 If you have Xpy Burner on your system, then it is recommended that you use a dependable anti-spyware program to locate and remove Xpy Burner and its files. Quick & tested solution for Xpy Burner removal.